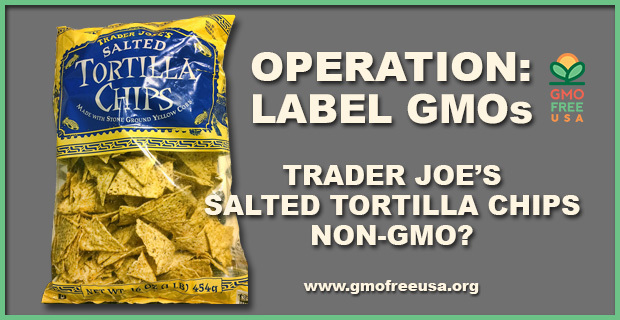 Does Trader Joe’s Salted Tortilla Chips Contain GMOs? CORN CONTENT: approximately 1% GMO. Trader Joe’s is a company that serves the natural foods market and claims, on their website, that their private label products contain “NO genetically modified ingredients”. With no mandatory GMO labeling requirements in the United States and no standards to define GMO free claims, many of our supporters wanted to know if their products are truly GMO free. We sent a bag of “Trader Joe’s Salted Tortilla Chips Made with Stone Ground Yellow Corn” to an accredited, independent lab to test for GMO content. The test found approximately 1% GMO corn in the chips. There are several factors that must be considered when evaluating the results of this test. First, with approximately 1% GMO content, this Trader Joe’s product is not truly GMO Free. Second, our test verifies that the bag of product tested would roughly qualify for Non-GMO status under the standard used by the Non-GMO Project. The Non-GMO Project standard allows for up to 9/10 of one percent (.9%) GMO contamination and mirrors the standards for GMO labeling used in the European Union. But we only tested one bag. There is no systematic, independent verification that Trader Joe’s non-GMO claim is accurate and consistent for the product line as a whole, long term. We feel it is also important to understand how and why this bag of corn chips contains approximately 1% GMO. One issue could be post-harvest contamination. Non-GMO and GMO seeds and grains could become mixed during handling and transport due to human errors or inadequate cleaning of machinery. The other issue, which is of paramount and long-term concern, is contamination in the field by cross-pollination. In the United States we do not have government mandated buffer zones between GMO and Non-GMO crops. A study which examined corn pollen drift over a 10 year period found that under normal circumstances, corn pollen could drift approximately 2.8 miles and cause some level of GMO contamination to Non-GMO crops grown within that range and perhaps farther. Our Organic and Non-GMO farmers are doing their best without any protection from the U.S. Government. Sadly, it is not enough for us to assume we’re safe because we buy only Organic or Non-GMO Project Verified foods. GMOs have contaminated our food supply to the point where there is now discussion about whether to allow some level of GMO contamination, even in Organics. GMO crops cannot coexist with Organic and Non-GMO without continued and growing genetic pollution of our food supply. Interestingly, according to the Organic Trade Association, “The use of genetically modified organisms (GMOs) is prohibited in organic products. This means an organic farmer can’t plant GMO seeds, an organic cow can’t eat GMO alfalfa or corn, and an organic soup producer can’t use any GMO ingredients. To meet the USDA organic regulations, farmers and processors must show they aren’t using GMOs, and that they are protecting their products from contact with prohibited substances, such as GMOs, from farm to table.” The requirement to guard organic products from contact with GMOs (prohibited substances) helps prevent GMO contamination of organic foods. But according to the National Organic Program (NOP), if a producer or processor follows the procedures specified in the organic standards but still, by cross pollination or accidental cross contamination, some GM material is present in an organic product, that product still is considered compliant with the National Organic Standard and can be found on your grocer’s shelf certified as organic. The Non-GMO Project recognizes the valuable contribution that organic makes by forbidding the intentional use of GMOs in organic production, and requiring strict traceability and the physical segregation of organic from any potentially GM material. But it takes the extra step of requiring ongoing testing of risk ingredients at critical control points to verify that GMO presence is no greater than 0.9% for food products and 1.5% for animal feed. The Non-GMO Project also verifies conventional (non-organic) foods to the same 0.9% threshold. This makes it possible for all consumers, whether they purchase organic or conventional foods, to avoid GMOs. We appreciate Trader Joe’s efforts in providing the products that their customers want, though we would still urge that Trader Joe’s submit to independent verification, such as the Non-GMO Project, and give their customers assurance that their entire company product line meets minimum non-GMO standards over the long term. 1) Demand mandatory GMO labeling using a standard at least equivalent to the European Union. Labeling GMOs and transparency of process will give us the information we need to exercise our freedom to choose. Informed consumers will fuel the growing demand for Non-GMO and will impact farmers’ decisions as to what they grow. Contact your House Representative and urge them to support H.R. 1699, the Genetically Engineered Food Right-To-Know Act, sponsored by Peter Defazio. Find your House Rep HERE (Enter your zip code and click the “Get Local!” button). 2) Support city and county level GMO crop bans. GMO free agricultural zones will limit the expansion of GMO technology. Sonoma County, California, is currently gathering signatures for a GMO crop cultivation ban 2016 ballot initiative. Please support GMO Free Sonoma County and their GMO Crop Ban Initiative.